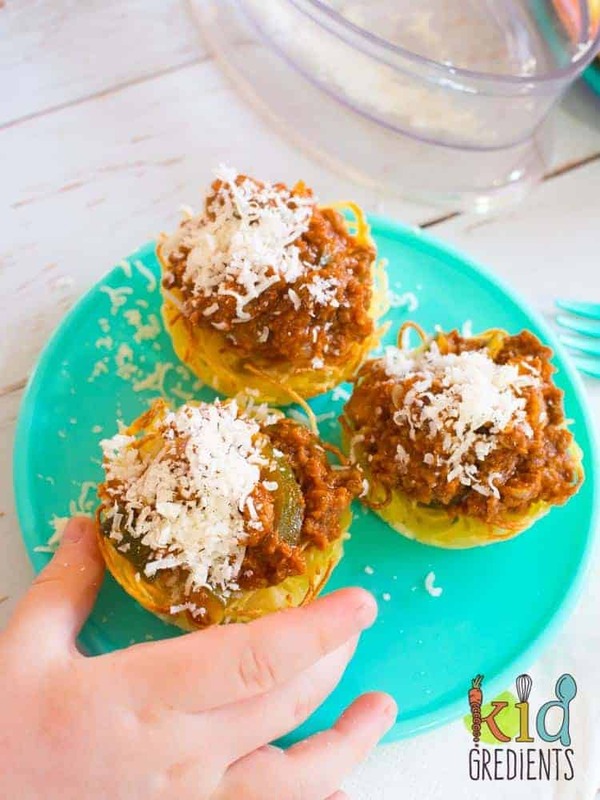 Making spaghetti nests is something I’ve been doing for a long time! They are much easier for little hands to manage and much less mess to eat! 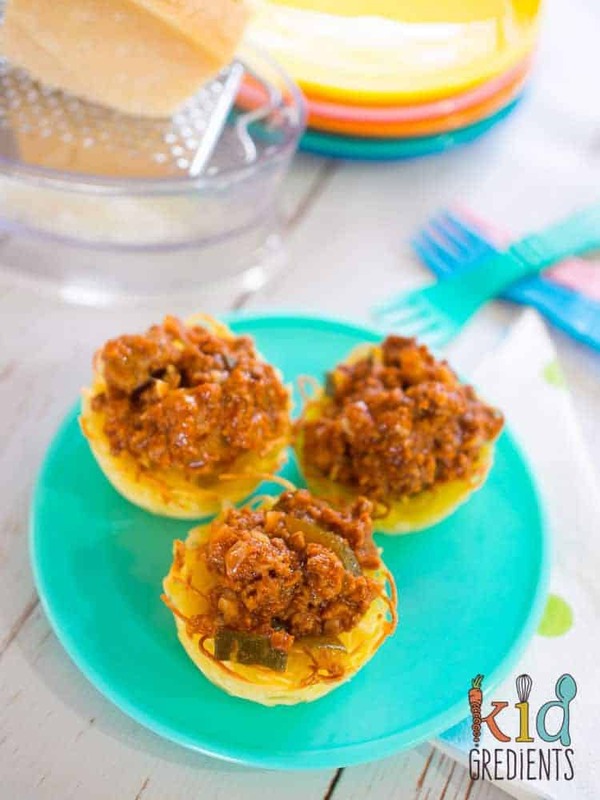 The quick bolognaise sauce that I made to go with these is also perfect with fresh pasta or baked into pies. The reason it works so well with the nests is it is thick and chunky, meaning it stays on top really well. 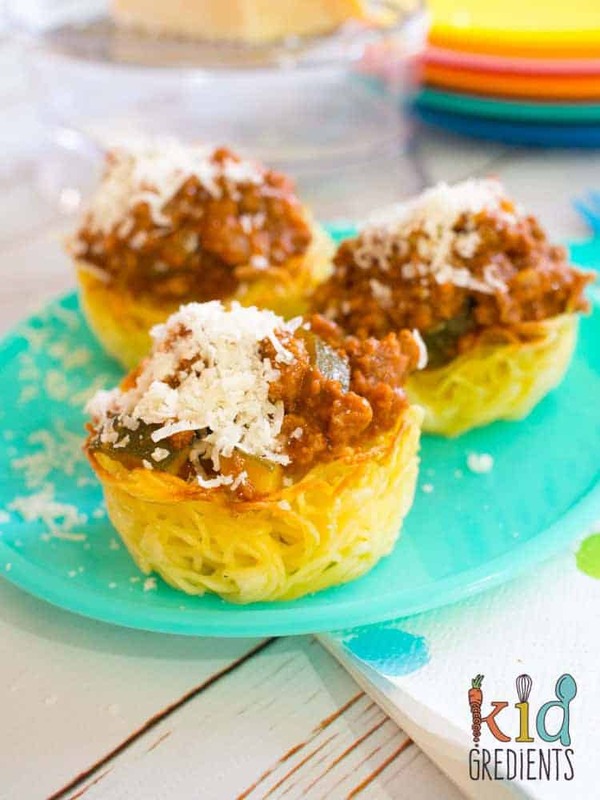 So here we go…spaghetti nests with quick bolognaise. 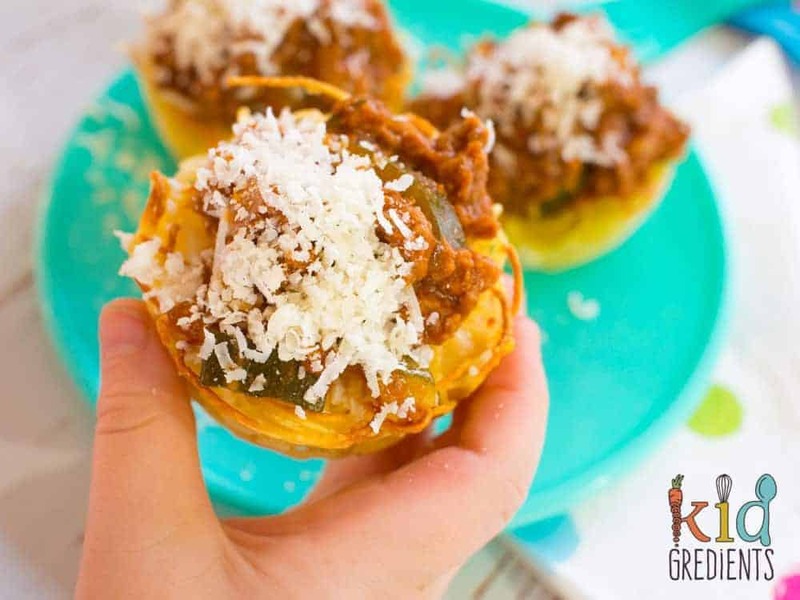 Easy to eat and a little less messy! I’ve sent these in the lunchbox cold too, that’s because I’m that mum that loves to push the boundaries of school lunches. Don’t be alarmed, these are quick to make and easy to enjoy. 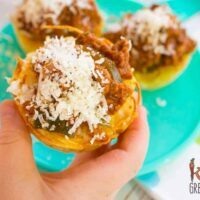 They are great as party food too and so great for bubs when they are learning to hold and eat foods. 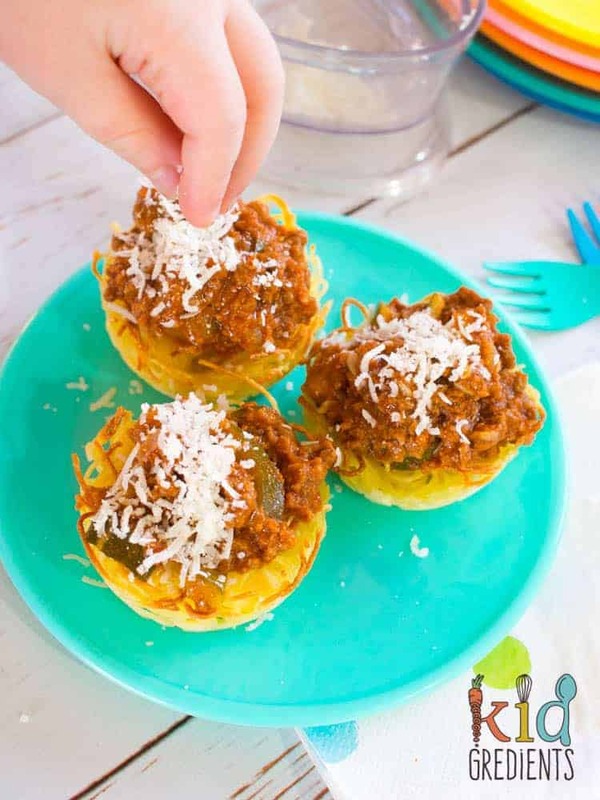 If you’re wondering why you would get to the bother of making spaghetti cups when you could just serve them spaghetti? Well, these basically mean my kids eat al the spaghetti, rather than getting 3/4 of it on the table, floor, their clothes, and hair. You don’t have to top these with my quick bolognaise, they are just as yummy with fresh tomatoes and chopped basil. Or try them with our superhero sauce! In fact you can top them with whatever you want. They are quick and easy to bake and freezer friendly. So do a double batch and pop some in the freezer. dinner has never been this yummy before! The sauce makes enough for 4 adult serves plus 12 pasta nest toppers! I freeze the leftovers for nights when cooking a sauce is just too hard. Baking the pasta makes it crunchy and hold together really well. Just make sure that you cool the pasta after cooking sufficiently before adding the egg! 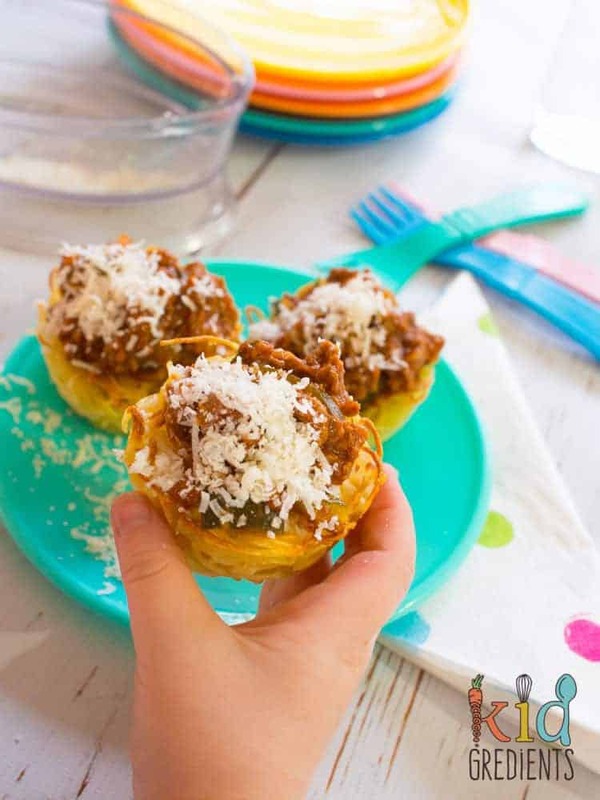 To make these appetisers, I do them in mini muffin trays….which means I make 24. They are super cute when small! Don’t take my word for it, the kids have been begging for these tasty morsels all week! Cook the angel hair following the packet instructions. 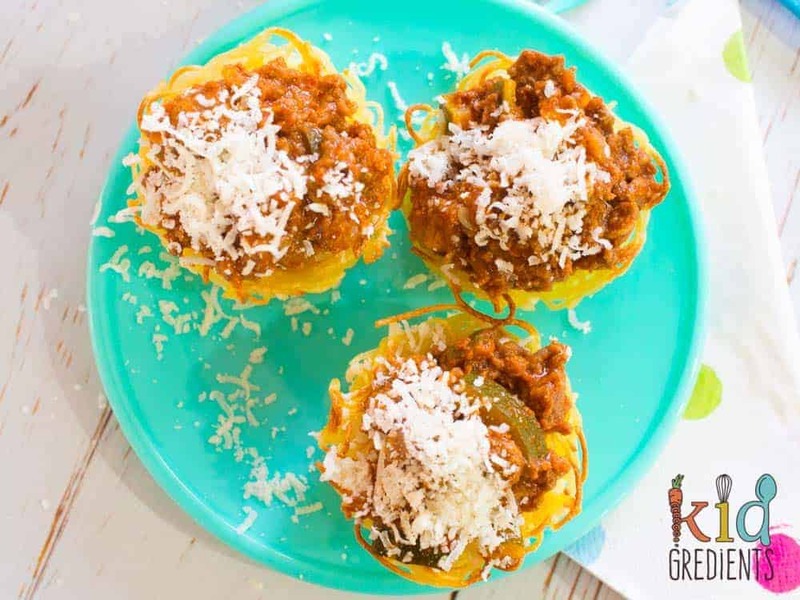 Mix the egg and parmesan through the pasta and divide evenly into a 12 hole muffin pan. Bake for 15 minutes at 180 degrees (355F). In a medium saucepan, heat the olive oil. Add the beef and crank the heat to brown it. Add the tomato paste and mix well through. Put in the zucchini, carrot and passata. Pop on a lid and cook for 15 minutes. Top the spaghetti nests with the sauce.